Cities are turning wastewater from an eyesore into something that is valued by industries. Photo credit: ADB. 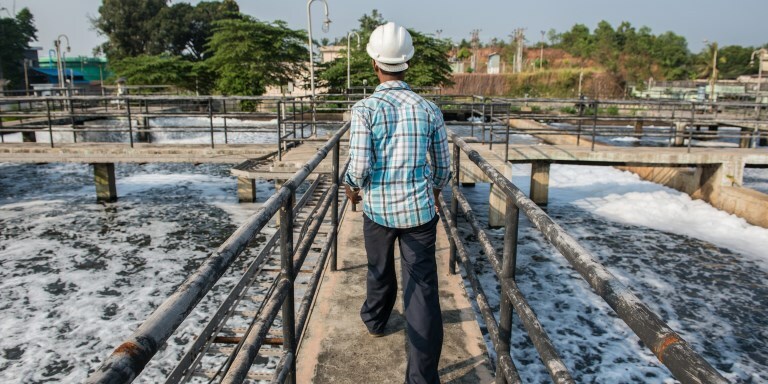 In the Indian city of Mangalore, the local government partnered with private companies to modernize the sewage system and turn wastewater into a valuable asset. Indian cities, which contribute more than 60% of the country’s GDP, face a major challenge in managing their wastewater in a scientific manner. A recent Asian Development Bank report calculated a $48 per capita income loss annually due to inadequate sanitation. According to the government’s own estimates, 94% of all cities and towns do not have sewers, and 80% of sewage generated is discharged untreated. The release of untreated water causes environmental degradation and poses a severe health hazard. Municipal bodies across India are struggling to manage wastewater systematically due to a lack of financial as well as human resources. Here, partnerships that tap into private sector expertise and resources can provide a possible solution. The southern port city of Mangalore in the state of Karnataka developed a public-private partnership that can be a model for other urban centers to replicate. Until the mid-2000s and like in most Indian cities, wastewater would flow down open drains in Mangalore. City administrators were looking for ways to deal with the fetid wastewater that was polluting nearby freshwater sources. To address the problem, the Mangalore City Corporation reached an agreement with the Mangalore Special Economic Zone so certain industries could use the wastewater treated at the sewage treatment plants set up by Mangalore City Corporation. Industrial demand for water in Mangalore is huge. Mangalore Special Economic Zone, which runs one of India’s successful special economic zones, with a cluster of industries running up investments exceeding $2 billion, was spending a lot of money on water and had to rely on a limited supply. The agreement mandated that in return for using treated effluent, Mangalore Special Economic Zone would bear 70% of the operation and maintenance costs of the pumping stations and sewage treatment plants managed by Mangalore City Corporation. The treated water is further processed in a tertiary treatment plant set up by Mangalore Special Economic Zone to make the water fit for industrial use. Since industrial demand for water continues to grow, Mangalore Special Economic Zone plans to scale up by constructing two more tertiary treatment plants. Once they become operational, this will further reduce Mangalore City Corporation’s spending to operate and maintain the sewage treatment plants and pumping stations in their respective catchments, besides bringing in more revenue for the city. What made the agreement possible was a centralized wastewater management system—created under the ADB-supported Karnataka Urban Development and Coastal Environmental Management Project—that can treat over 113 million liters per day. Building the infrastructure for collection, transmission (including pumping) and primary and secondary treatment of wastewater was the key to success. The sewer network was expanded to 350 kilometers of pipes feeding wastewater into the three sewage treatment plants. These facilities ensured the arrangement was economically viable for both parties. Beyond wastewater, Mangalore City Corporation used the partnership model to upgrade the municipal solid waste management system by engaging a private operator and recycling part of waste as soil conditioner. Mangalore City Corporation is also planning to provide uninterrupted water supply to the citizens by engaging a public or private operator. In little over a decade, Mangalore has made significant progress. It was ranked India’s third cleanest in a sanitation rating by the Union Urban Development Ministry in 2015. Mangalore is a prime example of how partnership between different stakeholders can work for mutual benefit, and how wastewater can be transformed from waste into a valuable asset. Sourav believes that the solution to smart cities lies in good governance, adoption of new technologies, and greater public participation. He has an academic background in civil engineering and urban planning. Before joining ADB in 2006, Sourav worked in complex urban infrastructure projects in India, mainly handling their planning, and engineering design and implementation. Saugata has been involved in the formulation and implementation of various ADB-financed urban infrastructure projects, urban health project, climate resilient infrastructure project and post disaster rehabilitation and re-construction projects in India. He has also taken part in extensive policy based discussions with the state agencies, to reform long established organizational structures and institutional practices of urban local bodies.